The stem of the perennial herbaceous plant Dendrobium loddigesis Rolfe., D. fimbriatum Hook. var. oculatum Hook., D. chrysanthum Wall., D. candidum Wall. ex Lindl., or D. nobile Lindl. of family Orchi-daceae. Mainly cultivated in Sichuan, Yunnan and Guizhou provinces in China. Collected all the year round, in autumn better. Nourish yin of stomach and kidney, clear heat of stomach and descend kidney fire. It is indicated for low fever, thirst, dryness in mouth and throat, discomfort, and slight or burning pain in stomach and abdomen due to stomach yin deficiency with heat, because it can nourish stomach yin, produce fluid to relieve thirst and clear stomach heat. It is usually combined with yin-nourishing and fluid-producing herbs. For dryness thirst, dry tongue with dry coating due to fluid hurted by heat, it is combined with Tian Hua Fen, Sheng Di Huang and Mai Dong in Qing Re Bao Jin Tang from Shi Bing Lun. For dryness in mouth and throat, red tongue with little coating due to stomach yin deficiency, it is decocted singly and used instead of tea, or combined with Mai Dong, Yu Zhu, etc. It is indicated for bone-steaming tidal fever due to yin deficiency with effulgent fire, or dim and poor vision, atrophy-flaccidity of tendon and bone due to kidney yin deficiency, because it can nourish kidney yin and dcscend deficiency fire. It should be combined with yin-nourishing, kidney-tonifying and symptom-suiting herbs. For bone-steaming tidal fever due to yin deficiency with effulgent fire, it is commonly combined with yin-nourishing, deficiency-heat-clearing herbs, such as Sheng Di Huang, Gou Qi Zi, Huang Bai and Hu Huang Lian. For dim and poor vision kidney yin deficiency, it is combined with kidney and liver-nourishing and sight-improving herbs. For instance, it is used with Gou Qi Zi, Shu Di Huang and Tu Si Zi in Shi Hu Ye Guang Wan from Yuan Ji Qi Wei (Introduction of Essence of Medicine). 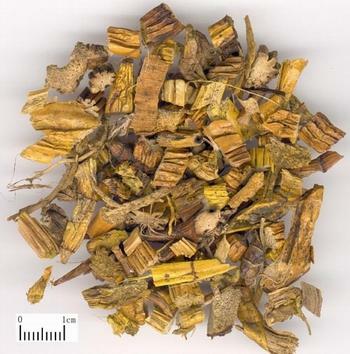 For atrophy-flaccidity of tendon and bone due to kidney yin deficiency, it is combined with kidney and liver-nourishing, tendon and bone-strengthening herbs, such as Shu Di Huang, Shan Zhu Yu, Du Zhong and Niu Xi. Decoct 10~15 g; the fresh 15~30 g.